Thanks Ann, I agree. 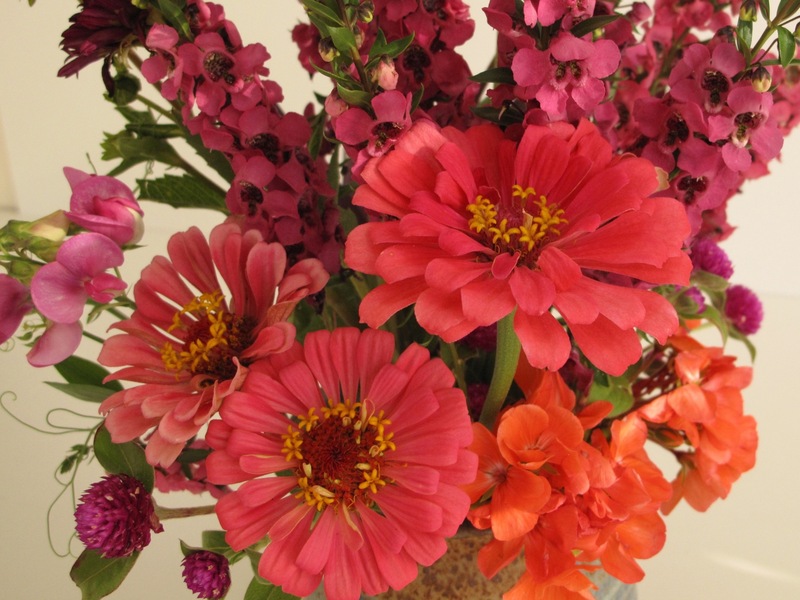 Zinnias provide an instant smile. Vivid and at the same time restraint and ‘Susie-zen’ -just lovely! Thanks Annette. I appreciate this observation. Now that you mention it I do notice the restraint–an important element in design. Wonderful zingy colours Susie, I have missed not seeing your posts after a months no access to WordPress – laptop problems, hopefully almost resolved now. I’ve borrowed an iPad today to try and catch up but cannot go back into anyone’s older posts, so just hope all is well with you and that July was kind. I am guessing by your lovely bouquet your heatwave did not last, at least I hope so! Hi Julie, so nice to hear from you! Sorry about your laptop woes. Having had serious problems with mine this summer I understand how disrupting it can be. The heat wave is not giving up at all and no rain in the forecast for the week. I’ve watered a lot this summer (for me) but it’s becoming impossible to keep things going now. Fortunately zinnias can take the heat. Sorry to hear the heatwave is continuing Susie, I can imagine how difficult that must be to see your garden in drought conditions. I haven’t grown Zinnias before but my mum with very chalky ground loves them. Thanks and Happy August to you Judy. Summer is slipping away. Just lovely to peer into each bloom, and your photography is great for this. Thanks Noelle. Flower structures are fascinating. What a fabulous mix of vivid colours, I love it. I am suddenly rather fond of orange and deep pink together in a vase, you live and learn and change your mind about things, well, I do anyway! Thank you! Informed decision-making or changing one’s mind, makes life interesting. The brilliant orange centers of echinacea against pink centers is what sold me on combining pink and orange a few years ago. I’m having trouble finding much blooming right now. The heat and drought have taken their toll on the garden and even the “drought-resistant” plants are questioning whether it’s worth it to keep going. So pretty Susie, such fabulous colours. 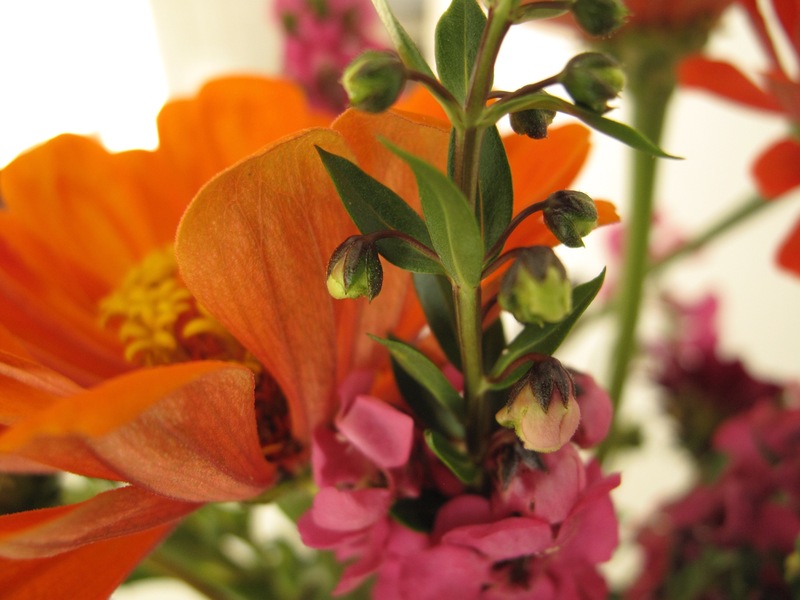 I love the Zinnias and I keep seeing that gorgeous Angelonia on blogs but I have never come across it here. I love it. Thanks. Angelonia is something you’ll probably see again in my vases–everything else is drying up without rain but it perseveres. Usually I have some zinnias volunteer from the previous year but not so this year. And since so few of the seed I planted germinated I’m treasuring the few zinnia flowers that made it. Oh just gorgeous. I am loving all these rich summery colours this week. What a treat to be able to visit so many talented flower arrangers. You cannot beat pink and orange together, it always reminds me of the fruit of the spindle tree, euonymus alatus I think. And thanks for hosting Cathy! It’s a treat to see your summery flowers and those of other participants. This arrangement looks good enough to eat, Susie. (Although the fact that I haven’t had breakfast yet may be playing a role in that response.) 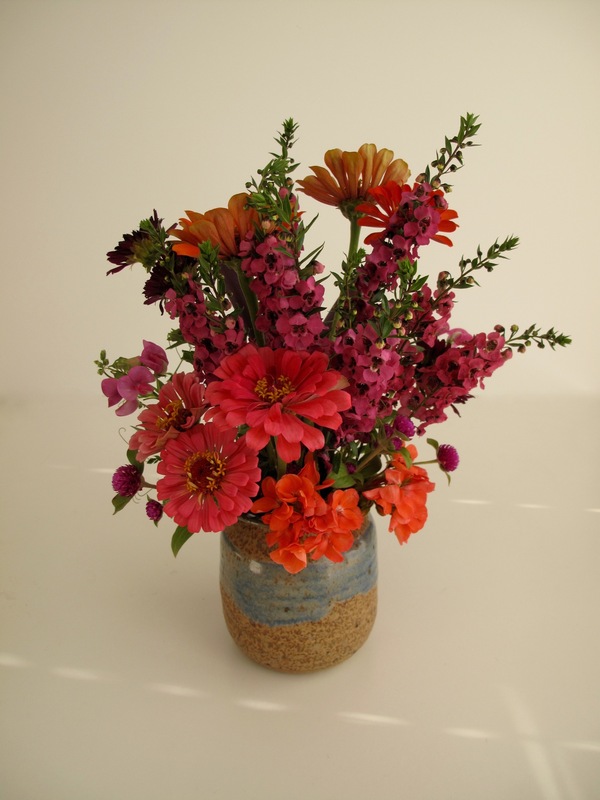 I love this color combination and your vase is the perfect accompaniment. I love the Angelonia and now wish I’d planted more this year – as it is I just have some scraggly plants that returned from last year’s planting. That cracked me up! Hope you found something to nibble on this morning. One year I bought some root-bound angelonia at the end of a summer sale. Taking advice from the salesperson I cut them down half-way, planted and watered them well and gave them some fertilizer (fertilizing is something I rarely do). The plants recovered within a week and last until October. Perhaps yours would revive with this treatment. I wish mine would overwinter but they don’t here. I’m already planning a big patch of Zinnias for next year (always next year, right? 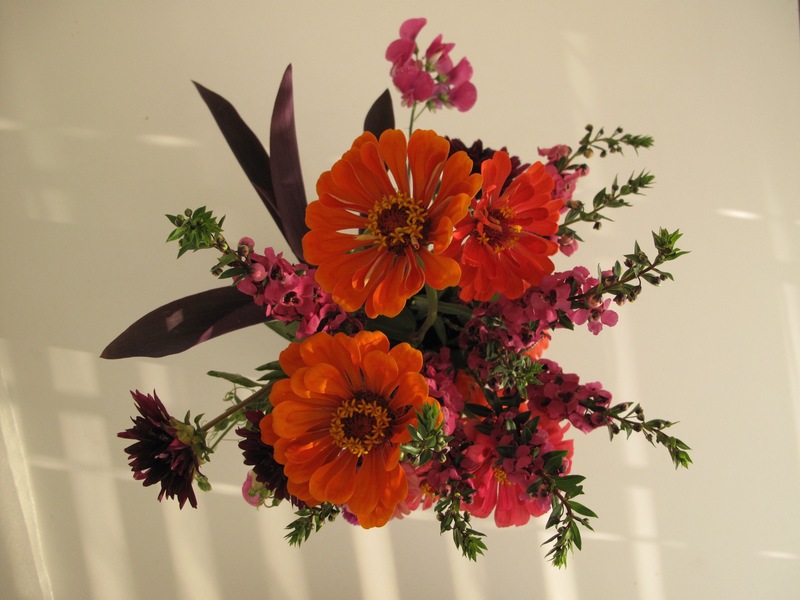 ), hoping to be able to put together many b ouquets like yours…I love it! Thanks so much Rickii, a high compliment indeed. Where would we gardeners be if we couldn’t imagine our gardens next year? Sounds like something Henry Mitchell would write about. 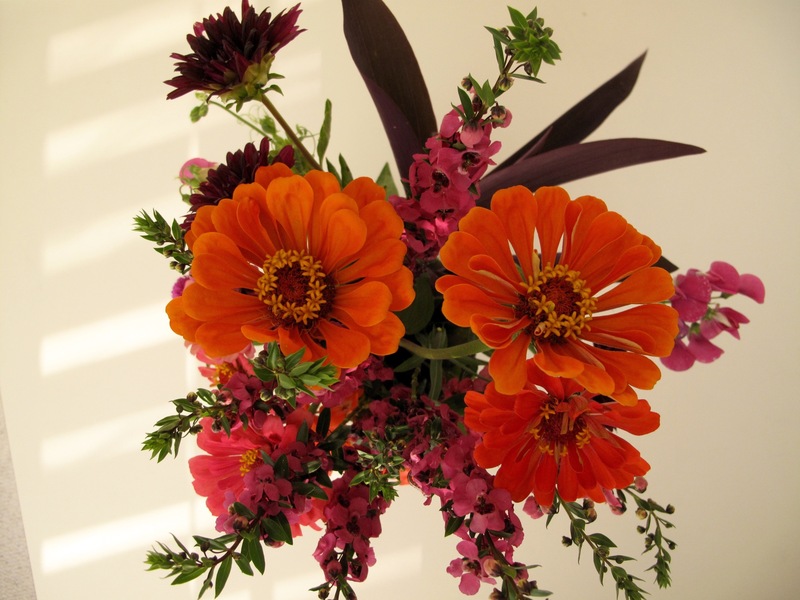 Oh Susie this is another stunner….you and Cathy both with those vivid colors….I only had one zinnia germinate and flower….but yours mixed with the other bright blooms are amazing. Thanks Donna. I don’t have many flowers blooming this week that are undamaged by the heat so it’s nice the ones that are flowering have strong colors to make it look like something is happening. Wonder why zinnia germination was a problem for you too? I had the same trouble and it’s very disappointing not to have more of an old favorite. 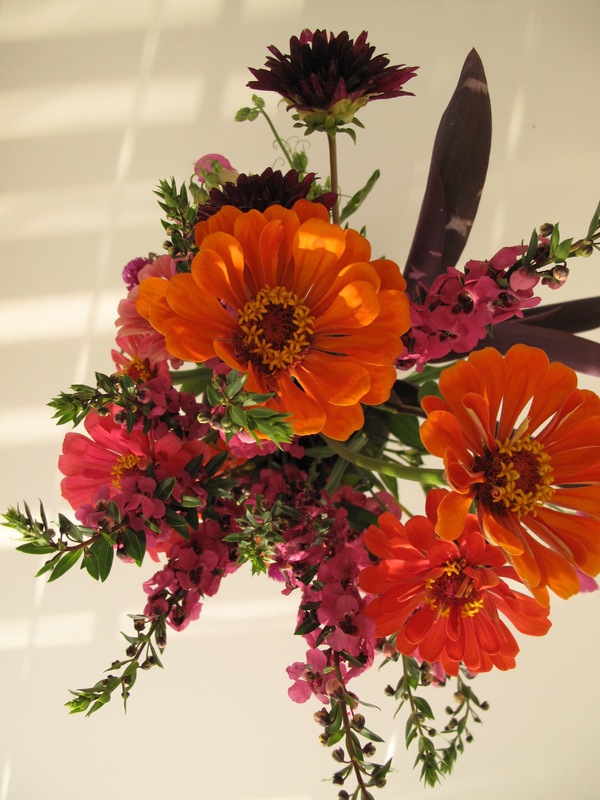 What a great combination of blooms Susie & I love the combination of pink and orange – it is a favourite of mine. The Angelonia is a new flower to me, but zinnias and dahlias are just getting into their stride here. Another week or two and I will have them in my vases. I like pink and orange too, depending on the situation of course. With flowers it seems possible to throw out all color rules and the flowers seem to exist peacefully. Angelonia has been my favorite annual for 3-4 years. It tolerates drought, doesn’t mind rain, needs no deadheading and blooms profusely until first frost. I’m looking forward to seeing your zinnias and dahlias soon. Lovely vibrant colours and I like the purple leaf contrast. I looked up Gromphrena as it looks a fun plant to have. Thanks. That purple heart leaf is nice, I agree. Gomphrena or globe amaranth is sort of old-fashioned I guess. I think it dries really well but haven’t grown it in a long time so not sure. 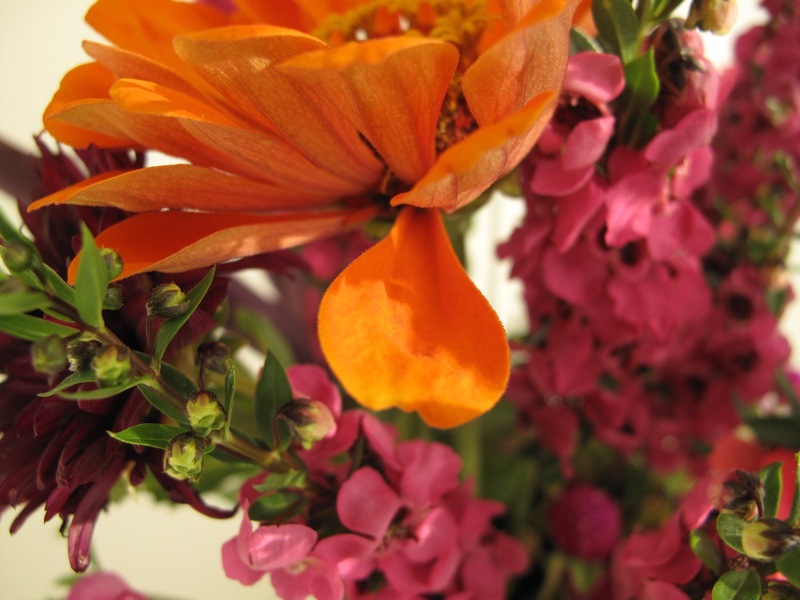 A colourful vase, Angelonia is unknown to me, it seems to suit your climate. Dahlias are a favourite, they do well here. Thanks Brian. I’m hoping the dahlias will pick up as we move toward fall. I’m fairly new to them and hoped they’d bloom more this summer. Fabulous summer colours and beautiful vases, Susie! So kind of you Anca. Thanks. It’s been a hot summer so these colors seem to match that heat. You wouldn’t think that orange and pink would go together, and yet they do. 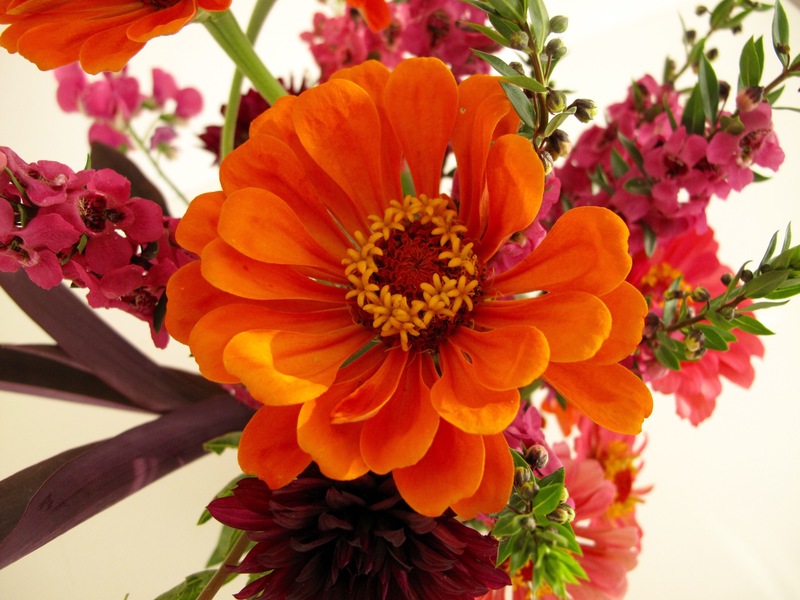 Love the orange Zinnia. No matter what pack of zinnias I plant, there are always a lot of pink ones, but somehow this year I manage a few orange and one red. I mentioned to Christina above, noticing the brilliant orange centers of echinacea against pink centers is what sold me on combining pink and orange a few years ago. Good enough for nature, works for me too. Oh goodness–that is gorgeous! I have some of those same plants growing here and you’ve given me inspiration. This is the first year I’ve grown Angelonia and I’ve fallen in love with it. It’s a great potted annual plant and it has a decent vase life (a few days). Lovely combination. Thanks Beth. I know how you feel about Angelonia I’ve been planting it in my meditation circle for the past 3-4 years and it is so reliable and beautiful. Love the colors you highlight, and the rich, visual complexity of your bouquets. Thanks so much Charlie. The garden is not producing well at this time year so I picked what was available. Somehow, they all play well together! They are all summer flowers but they seem to speak for autumn as well. You’re so right! Autumn is sneaking in everywhere, in many subtle ways. Vivid and beautiful! 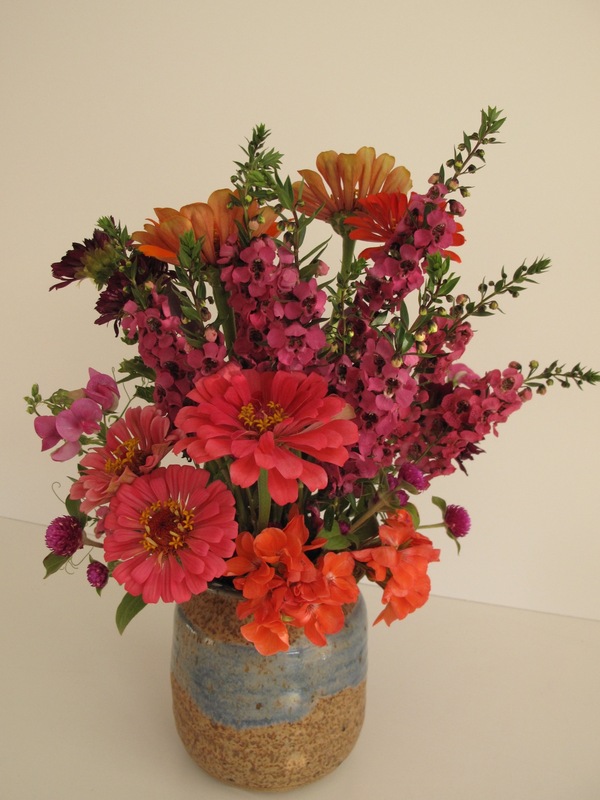 I love the hot-colored Zinnias!